“What will you give back to the society?" Ask myself at the very beginning of the project. More precisely, I asked myself: "What will you give back to the neighbors?" That was early 2014. I was just starting to read Artificial Hell book by Claire Bishop and a quote from Dan Graham at the very beginning of it stuck in my mind when I think about the project I was about to make: "All artists are alike. They dream of doing something that's more social, more collaborative, and more real than art." The project did not have a name back then. It was just layers of thoughts and desire piling up into a proposal that I keep on updating every few months. I see it more like a strong impulse to create an ‘archive’ of a place where I grew up in, after seeing the neighboring village buried in ashes few years ago in one of the biggest Merapi eruption. I had no confidence that this project will even manifested in any demonstrable outcomes aside from probably a book; and with almost non-existent tradition of public funding in art here, the project is without money. Its possibility to manifest, nevermind its continuity, is in continuous doubt. Working on this project is like signing up to a complex contestation in the discourse of 'public art' in its many faces and different terminologies: site-specific, community-engagement, participatory art, social practice, and so on. There are constantly reoccurring questions of a seemingly generalized set of ethical precepts that lingers in many aspects of the relationship between the guest and the host, the taking and giving back in return, the contribution to society and the artistic value. Will the specificity of the place and local values change that general code of conduct? What perspective can I offer with such a close personal proximity to the site? What method of communication and consent can be done to achieve mutual benefit shared between all parties? The whole process has been an endless stream of self-doubt and self-critic to the point that the final exhibition was so close to cancelation for many times. This was the hardest part of the process. Meanwhile, one by one the artists’ solo projects are being made. Slowly but surely, the artists’ individual projects are piling up, ready to be presented in the final exhibition. Another reason why it was a long and slow process: it takes time for the guests (the artists) to build a meaningful relationship with the host (local people) and to find a story that matters enough to tell. My logic was sometime switched between that of an editor trying to make an anthology of site-specific short stories and turn it into a book and a curator trying to make a collective solo exhibitions. But that ‘book’, is about my very own beloved hometown, about my neighbors, about people and place that hold a special place in my heart— of course I feel the need to work closely with each of the ‘authors’ to walk them through my fascination of it and provide insider view on the site and the context of it. My position as the curator of the show and a local member of the community becomes both my strength and my weakness. Each now and then, I need to step away from the site to get clearer perspective and a whole picture of the situation. Yet, it was that personal relation to the neighbors that enable the artists to have a more personal relationship with the local and stories that goes deeper than the surface. I remember presenting the rough sketch of 900mdpl project plan for a group of Western European critics and curators during my interview for a curatorial program, and they asked three things: 1/ how do you plan to sell the work of the artist in this project and give back to the society, 2/ what if the project become famous and it accidentally support gentrification to the area, and 3/ a commentary about relational aesthetic practice I was making. I found the last question/ commentary completely irrelevant and uninteresting. The relational aesthetic theory is probably suited for a museum study or relational works presented in the comfort of white spaces but not for a pseudo-curator like me who did not formally studied art (at least at that moment when I have not yet participated in De Appel Curatorial Program), who live in a country lacking of formal contemporary art infrastructure and art systems as it is known in the West, and doing a so-called post-studio practice without ever doing a studio practice. At that moment when the third remark arise, I shrugged and said “I never learn about it and I don’t know enough of it to say what I was doing or going to do is considered as relational aesthetic at all. That is just what I do.” That was before De Appel CP, when I was a rebel and a naïve and wanting so much to learn about the ‘rules’ that I have probably been breaking all these times. I wanted to actually learn and understand if there is even a general set of ‘rule’ in the global contemporary art scene before going back to my practice: having a context and a perspective of a studio practice before going back to my ‘post-studio’ practice. Taking a step away from home to return and see it from that point of view. Making a short escape as an act of returning. That is the perspective I am going to use in this text to look back to the questions on ethics, impacts, and its implementations in the project. The second question about gentrification is probably the question with the most optimistic tone. “What if the project become famous and it accidentally support gentrification to the area?” For the project to have such a powerful impact to gentrification, it needs to be very successful in a way that the government will notice. It means there are instant gratifications in the easiest way understandable such as huge number of visitor, big flow of money, media coverage, increase on employability, and so on. No matter how difficult it is to achieve, all of those do not sound so bad at all. (And please refrain from thinking that I am a supporter of gentrification.) The thing is, Kaliurang has been gentrified a long time ago. The government used to made a persistent tourism campaign, working hand in hand with the local residents, and enjoyed its heyday in the 80s to late 90s. But instead of making life unaffordable for the local residents, it creates employability, entrepreneurship, and opportunities for the local. Kaliurang turned out to be a place full of small businesses, home industry, and every other houses open their home for rent as small hostel or BnB. There was one moment in 1994 when the hotel occupancy was so high that the government decided not to give formal warning about the rising activity of the volcano, resulting in a number of casualties consisting of unprepared locals and clueless tourists. The tourism industry is slowly going down from that moment. Kaliurang has its glorious time and each time the volcano erupted, the businesses tumble down. It is a steady step downward for small businesses in this area. It collapses every now and then, many times leaving the local with options to sell their land. It broke my heart to see my next door neighbor sell his family house after the profitability of his business went down and to see developers came to build even fancier hotels in this small village with way too many hotels and not enough natural resources. Water crisis is a reoccurring issue, temperature rise, and green patches are turning into concretes. When local business keeps on going down, the local people are forced to move aside. The ecosystem is at stake when big money enters without considering the local wisdoms. It was exactly how a new five story hotel with rooftop pool suddenly pop up in a small village with water issue and close proximity to an active volcano. It is not only a ridiculous but also completely ignorant to the long-nourished ecosystem-friendly local wisdoms followed by people in the village surrounding the volcano. One unique characteristic of the people here is that no matter how the volcano erupts every four to six years, they keep on going back home. Local is facing the terror of having to sell their land only if it is their last resort. So, if, in its most optimistic point of view, this art project become famous and attracts tourist to visit Kaliurang or make people pay attention to it once again: good! The local businesses can sustain, incomes are generated for the locals, employability rise, and the number of visitor will contribute to the local income from its entrance ticket at Kaliurang gate to use for public facility maintenance. The popularity of the project is supposedly becoming the opposite to gentrification. The possibilities of increasing economic opportunity is an autonomous struggle against gentrification. But realistically, the project is not going to be big enough nor having such instant economic value—at least not in its first edition. A bigger effort and even stronger community engagement is needed in order to achieve that goal, if it even becoming the goal at all. Such ‘real’ impact of the project as imagined in this paragraph is a bonus point while the initial purpose and motivation in creating the project was just as simple as to share and archive the collective memory of this place. This leads to the first and hardest question, my square one: the question on how to give back to the society. “How do I plan to sell the work of the artist in this project and give back to the society?” First, on selling the work of the artist. At the time the question was asked, I answered that I have no plan in selling it because I am not even sure whether the work of the artists will be materialized as an “artwork” instead of as fragments or series of happening, performances, social events, classes, and so on. As for the part of giving back to the society, I paused. I did not know the answer just yet. So, that particular part of the question lingers. It turns into a long pause and a reoccurring hesitation. Jumping into a provincial place with a very closely knit society where people are inevitably related to one another and grow up together all these years, what if art as people know it (away from the glitters and the discourses of the contemporary art), has always been social? I remember growing up seeing my parents go to monthly community gathering to discuss all new creative strategy for an event to be held in order to attract more visitors to the area. Every now and then, the neighbors will come and visit one another to casually chat about the weather, the children, the price of the chilies, and the strategy for the next spectacle. I remember several MURI (Indonesian Record Museum) awards given to the villagers for their initiative in making the longest ampyang (caramelized peanuts) or biggest jadah (sticky rice) in the world. In 1999, the local formed a committee and made a serious event around that longest ampyang in the world. The initiator of the project conducted the whole event and coordinate people to make it happen. A team of younger people was equipped with neatly typed and photocopied proposal of the events for them to get crowd-funding by asking money to the local hotel owners, who (out of politeness or common goal) will reach deep into their pocket and make donations for the event. Another team of people are working on the event, preparing the final presentation, convince the local ampyang makers to join forces and cook the biggest local delicacies on the spot, make sure that the journalists and representatives of the media and of the government are present; speeches are made, and local musicians ready to entertain the guests. Thousands of visitors went to the big celebration with the hope that the echo will linger and tourist keep coming for the next few months until the next big thing is held. The same formula has been replicated so many times as a repetitive effort to attract tourist to come especially after every volcanic activity; from inviting famous local band that attracts thousands of visitors in one night, making drawing competition for children on Earth day, pushing the artistic ability of the youngsters to make figurative lampions for the annual light festival, doing tapa bisu (silent meditation walk) around the village, to collaborating with artists to held an international dance festival every other year. The formula consist of one day, one big event, one goal: number of visitors. The hotel owners pays the cost, the others contribute by working voluntarily, and the echo of it is expected to last longer than the length of the event. As a teenager and a member of the society, I had to join those meetings where people try to pop another creative idea for the community, volunteering for the events, and even leading some of it. Each time, my question will always be about its sustainability— continuity, repetition, the length the echo can reach, and its effectivity. And when I grew up, I ask myself, what can I do— in my capacity as a curator, for the society in Kaliurang? So I thought, maybe, if I can make a continuous platform of a periodical art event— be it a biennale, a triennial, or even a decennial; can continuity and visits be expected and calculated? That is probably my wildest thought because, how could a young independent curator with no funding can make anything resembling a biennale? And in this case, the square one question of what to give back to the society is actually a looping question because the art project itself is meant to be a way to give back for the society: a tribute to the place and the people. And from this tribute comes the looping question: what can art give back to the society? What if other things in everyday life here, has already been more social, more collaborative, and more real than art? After spending years of questioning what art can do in this context, I took a shortcut: ask the community in person. Guessing what the community might need and deciding on something to ‘solve’ the problem they might not actually have do not seem right for me. Such approach has been done many times by ‘visitors’ (be it an NGO, a group of students, or a philanthropist) who decided that we (Kaliurang people) need a certain help but end up cleaning up the mess after few photographs for the fund report. But at the same time, I did not want to compromise the artist’s aesthetic, the depth of their research, and their art project for the exhibition that often comes in a package with socially engaged art. The artists in the main project has the freedom to choose whether they want to involve the community in their project or focusing more on the site specificity. In the other side, why not providing a public program, specifically designed for the neighbors? That was how the public program first planned: pragmatically. In our initial research in deciding the public program, we meet several communities with different age groups: children, young adults, and senior citizen. The toddlers school’s needs were as simple as a program for one or two days to lighten the voluntary worker’s job in ‘teaching’ the class (playgroup) for four days in a week. For them, we invited Viki Restina Bela, a comic artist and muralist who spend few days accompanying the toddlers to create a site-specific mural as a tribute to a local food seller whose shop has been operating for more than 27 years and has become the hub and meeting point for many generations in Kaliurang: the old generation of students who now grew up as the parents of the young student who all becoming the regular of the shop. The seller, Budhe Han (Auntie Han) is an old lady with a Parkinson disease who loyally open her shop every weekday, serving simple meatball soup with her trembling hand to the customers. The meatball is never just a meatball anymore. The value of it has shifted into nostalgia and comfort food that never change from the childhood memory of the majority of people in Kaliurang. For her work titled “Melepas Kerinduan di Warung Budhe Han” (Releasing the longing feeling in auntie Han’s shop), Viki draws an outline of children holding Budhe Han’s hand on one side and her holding a group of adults on the other side. The children from the playgroup that is located in the same area as the shop are invited to color together with their parents and students, all of whom are the loyal customer of Budhe Han’s shop. It was simple, straightforward, and easily understood as an ‘art project’ by the local (unlike, for example, Maryanto’s conceptual landscape installation). Before the mural even finished, the teacher already asked for more, “When will we do this again?” (There goes another question on continuity.) It makes me think about Moelyono, the artist who work closely with the community by becoming their drawing teacher, sharing the values and addressing the problem of the community from the grassroots level. If there ever be the next edition to this project, perhaps inviting artist to be regular volunteer to teach art to the local community can be a possible option. The second age group, the senior citizens needs entertainment, acknowledgement, and extra activity for their pastime aside from their weekly class (that, and a set of kulintang- traditional music orchestra that we cannot afford). 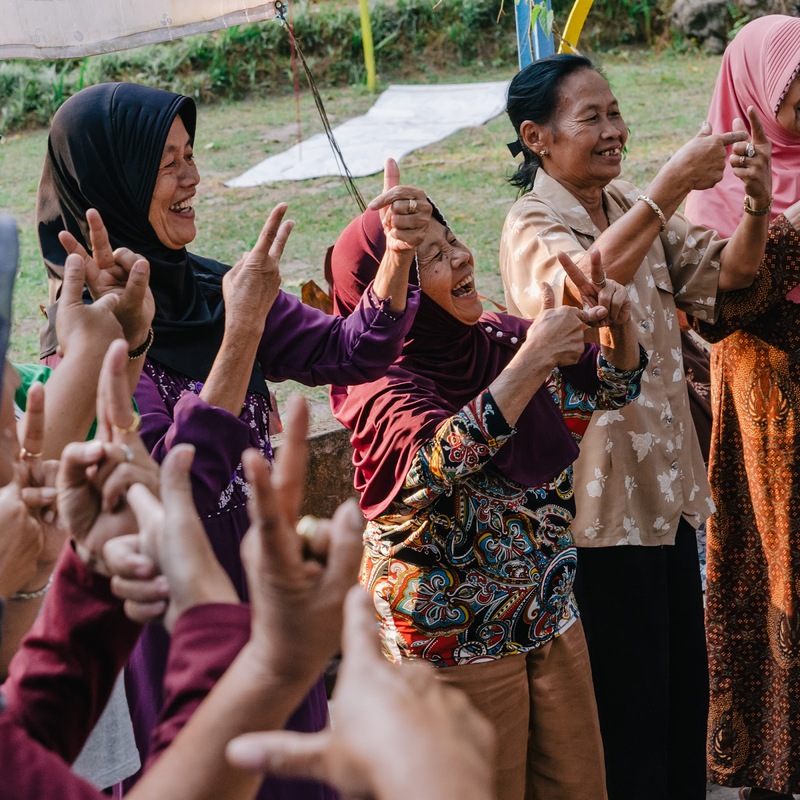 Anggun Priambodo is among the artists from the main exhibition who decided to work closely with this group, resulting in an amicable personal relationship between him and the elderly aside from the music video, video screening, an extra class, and a walk that he conducted for them. Few months after the project was finished, the elderly still often asked for Anggun while the artist himself still seeks for possibilities to continue his project in another way. The young adults’ needs are more complex. When we first gather the most active youngsters in Kaliurang, they start identifying what they thought as their peers’ problems: too much times in their hands and overly leisure moment that caused teenage pregnancy, early marriage, and risk of petty crime. In then next gatherings, when we ask them what kind of skill they might need to learn, one of them answered, “How to find new path for the jeep (their tourist attraction business)". The answer shows how little does art ability to contribute to this specific society. On the third meeting, we learn how serious were their effort to promote the area through online campaign #kaliurangpenak or #visitkaliurang, vlogs, music videos, and one or two public events. From this meeting, our response was to invite Arief Budiman from Video Battle and Fitro Dizianto from Sewon Screening to do intensive video literacy classes for the young adults who has specific interest and ability in making video in order to further develop their branding strategy and publicity for the area. There is no end result to this classes but on the second class (which is also the fifth meeting), we reconsider our approach in trying to engage with them as the number of the youth joining the meeting has been slowly decreased from more than ten during the first two meetings down to two in the last one. Meanwhile, one of the local youth, Alwirata Kusuma, joined as one of the active contributor to the project with his plan in promoting the stories of unique local figures as well as archiving it through instagram account @wargakaliurang. The account failed to be launched on the exhibition period due to conflicting time table but still holding its potential to be continued in the near future. The two failing projects worried us, what if those programs are not exactly answering their needs but starting to feel like a peer pressure? Who exactly is needing the community engagement: the project or the community? Opening up the project ‘for the community to join’ can sometime feels like putting us in an uncomfortable patronizing position. So we reconsider our stand point, not continuing the formal class nor the launching of the instagram account, and to our surprise, the remaining young man who joined the last video class keep on coming back to our office simply to hang out, chat, and eventually be part of our small team. This goes had in hand with an interesting lesson on transaction happened in one of the meeting when we offer the local youth to become the local exhibition guide with hourly wage. Their answer confused me: they are willing to be the local exhibition guide but not wanting to be paid because they want to do it “for the sake of Kaliurang”. Not comfortable with the idea to use them as unpaid exhibition guide, we decided to attended for the exhibition ourselves (the small team of 900mdpl). Still, some of them come to hangout in the meeting point of 900mdpl site, accompanying those who are doing the exhibition guide shift, sometime quenching their curiosity about contemporary art, and sometime simply share a good card game over a bowl of rujak (fruit salad). Our frustration on how the number of local youth involvement went down from ten to two turns into exhilaration: it was not a peer pressure that keeps them coming back, it was a matter of interest. They are the remaining local youth who are actually interested to the point of having a sense of belonging to be part of the project team. This part of the public program was not as successfully done as we wish it to be, yet, the quality of the personal relationship remains one of the most favorable. The last artist to be invited as a part of the public program was Azizi Al Majid who then created two infographics about the project, offering his point of view as one of the walker and first audience of the project. His relationship with the community is more subtle: he offers a visual language that feels more familiar, catchy, and easily understood in a project that needs a lot of narrative explanation. His works are presented in two setting: the first is displayed in front of the meeting point as both infographic and background to visitor’s ‘(insert name) was here’ photographs; the second is displayed in full exhibition setting in the gallery of Lir Space in the city, 25km away from Kaliurang, just in case if there are audiences who need virtual walk around the exhibition site without the need to travel all the way up to the mountain. It was as straightforward, informative, and as catchy as the way an information center can be. The public program that was designed to answer questions, providing immediate (hopefully real) effect, and many times self-censored for morality, fear, frustration, and ethical reasons; left me with more questions and insecurities. Taking a position of a native insider who initiate the project with full consciousness of the host and guest relationship, while being the curator of the art project, bearing the responsibility of it in the sphere of contemporary art discourse, certainly did not make that position easier. To critically look back and read the project from a distance requires me a certain set of language and evaluation standard. “To stay local is to risk provincialism; to go global risk dilution” (Bishop, 2012). Later, my back-and-forth perspective make me question whether there is a non-universal set of value, code-of-conduct, and non-generalized ethical measurement that is specifically following the local customs and different contour of social intimacy. Is site-specificity also applied in the equation of correctness and in contextualizing the evaluation of an art project? The main project of 900mdpl was done in a more subtle and slow-working process focusing more on the production of site-specific art and promoting intimacy, in-depth relationship, acknowledgements, urge for a story to be told, sharing sense of purpose and belonging, and celebration of daily life. At the same time, it aim to build new audience in art and answering an archival impulse for a fleeting and continuously changing community located in a high-risk area. Maybe, the public programs also need slow curating as it was applied in the main project. The next edition might not be the answer for the question of continuity and sustainability just yet, but persistence and continuous effort to evaluate the relationship between all parties can still be applied. The constant self-question on my position as both the curator and local member of the community, the position of the artists as the guest who offers perspective and outsider view as well as becoming the archiver of the story and the storyteller; the local community, the specificity of place, and the people. And if I can only recap the project in one sentence, stash my fear and insecurity (that almost bring this project to cancelation for so many times) under the rugs, the first edition of 900mdpl is “a project that feels pretty good”. It all still far from being the perfect example of art practice in the public sphere, but as long as it feels good, it will do for now.